CBS!!! One of the most sought after beers in 2011 after it was announced that it would be packaged into 750mL bottles. Selling at $18 per bottle at the brewery on October 1st, I’m sure it was a mad house as that is a great price point for such a phenomenal, highly coveted beer. Their blog states that CBS is the main reason behind their Backstage Series of specialty beers. Previously released only on tap in select locations the initiation of a bottled format caused a buzz in the craft beer world. 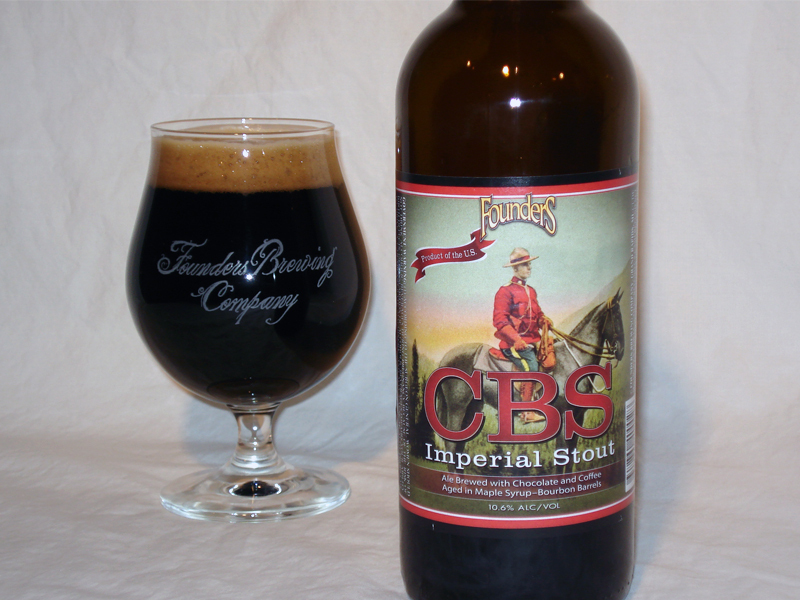 I think it is safe to say that CBS is the pinnacle of their stouts. Taking the base Imperial Stout with its huge flavor we move on to their Breakfast Stout brewed with coffee, chocolate, and oats. From there that brew is then aged in Kentucky Bourbon barrels to create KBS. Then, when you thought it was not possible to perfect, Founders took that Bourbon barrel aging and used ones which once contained Michigan maple syrup to create CBS (giving nod to our Northern friends). On December 1st, 2011 I had the privilege of sampling this beer for the first time on draft at the Bavarian Lodge in Lisle, IL. Founders had a tap takeover and boy was it a rush. Arriving shortly after 3pm there was a long line for a 4pm opening. I was one of the lucky few to get a glass of CBS and Black Biscuit before the kegs popped 15 minutes into the event. In all honesty it tastes very similar in both bottle and draft form which I think speaks a lot to the quality of the brew. On Tap: Deep mocha/tan head that is dense and creamy resting atop a viscous jet black body (syrup-like) that has legs. Dark ruby edges were noticeable. Huge coffee notes, astringent burnt grains, oats, and an abv sting. Maple syrup on the nose for sure. Caramel and vanilla come across big and bold. The taste was that of raisins and vanilla. The mouthfeel was thick, silky, smooth and almost buttery (oily). It seemed to combine all the other stouts Founders makes. Notes of plum and dark fruits are found in aftertaste. Delicious and so good, CBS great sweet notes that help to mask the abv. Bottle: Poured a deep opaque black/brown color with a dense dark khaki head. The appearance is very similar to its preceding stouts. Something that I found interesting is that CBS seems much more viscous than KBS although both are barrel aged. I gather this is due to the maple syrup which most likely lined the barrel. Also the abv is much lower than KBS. I’m not sure what to attribute to that as syrup is refined sugar. Right from the broken seal I could smell a plethora of delicious burnt grain, roasted coffee, and chocolate notes. Big roasted notes found in the Imperial Stout coat the nose while the maple syrup quality provide a relieving sweetness. The coffee was the prevailing aroma, but it helped to highlight the grains, chocolate and syrup. I’d say this is more of a Breakfast stout in all honesty. All the ingredients to start your day. There was an additional spiciness which smelled a bit like cinnamon or nutmeg found in the aroma. Rich, hearty and bold it was one of the best smelling beers I have come across. The flavor was unique and well balanced. All aspects of this beer worked together to complement each other while at the same time stand alone. There was a definite sweet quality that coated the front of the palate while letting the astringent grains and coffee flavors offer their soothing effects. At colder temps it was smooth with bitter chocolate notes. At warmer temps I received the full range of flavors from all aspects of the beer. This gives way to the caramel and vanilla flavors. The coffee accented the syrup to create a breakfast blend type of roast. The chocolate and syrup made me think of chocolate chip pancakes. The the maple syrup itself recalled the wonderful taste of Stroopwafel. Additional notes of brown sugar, treacle, molasses, and black licorice were evident at different point of each sip. The finish had a slight hoppy tingle to it that is piney and earthy along with a campfire smoke. Barrel aging provides a very dry oaky tannin finish and aftertaste that is supplemented by the sweet syrup flavor and a burnt oats/grainy character. Be advised: CBS is super smooth! Founders CBS lives up to the hype in so many ways. Crafted with quality and care it stands as a benchmark for what a great Spirit-aged beer can offer…let alone what ingenuity can produce. If you are a die-hard (that’s for you Jake) fan of Founders, Imperial Stouts, barrel aged stouts, or maple syrup I would recommend acquiring a bottle for your personal enjoyment. I would definitely recommend letting this beer warm as you drink.